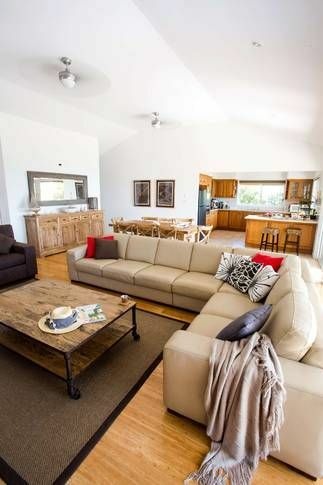 Comfort on the Rocks is located in one of the premier water front positions in Currarong with views over the infamous Currarong Rock Pool and the Pacific Ocean. Enjoy water views from the kitchen, living/dining and large undercover veranda. Watch dolphins and whales explore the bay, boats and kayaker's gliding past and marvel at the magnificent sunsets. Enjoy a game of cricket/volleyball on the large reserve area out front, play in the rock pools, stroll along the safe secluded beaches or play a game of tennis at the local courts nearby. On a cold winters day take a bushwalk or bike ride at the nearby peninsular or just sit & relax by the open log fire. The village atmosphere of Currarong provides the perfect place to relax and get away from the stresses of everyday living. Currarong is located on the Beecroft Peninsula, the northern headland of Jervis Bay. It is a 2.5 hour drive from Sydney, 1.5 hours from Wollongong and approx. 3 hours from Canberra. There are many bushwalks that can be taken directly from the house. Visit Jervis Bay National Park, Honeymoon Bay or explore historic Point Perpendicular lighthouse. At your doorstep is sheltered Abrahams Bosom and Warrain beaches. For the boating enthusiasts there is a dual access boat ramp located close by which provides access to some fantastic fishing spots. Other water sports available include kayaking, rock exploring, swimming, snorkeling, scuba diving and surfing. Dolphins can be seen from the front veranda throughout the year and occasionally whales which frequent the south coast waters between May and November. Children will enjoy watching the kangaroos feed on the grass in the morning hours from the front veranda. A local convenience store, cafe & fish & chip shop is only a 5 minute stroll away. There is a Woolworths supermarket & bottle shop in Culburra which is just 18kms away and at Nowra you will find Stocklands which houses the major stores. Callala Bay has an IGA, Butcher, bakery, bottle shop and pharmacy. Tennis courts located just a block away are available for hire and there is also a skate park. Bring your pushbikes - Currarong is a great place for bike riding either on the beach, on the many tracks through the national parks or even around the quiet streets. Currarong also has a Bowling Club with an ATM Machine and a Chinese restaurant. The Club offers limited entertainment during the holiday seasons. Enjoy a game of golf at Callala RSL Country Club, Nowra Golf Club or Vincentia Golf Club, all located just a short drive away. Zac's Place: This BYO fish café is located by the beach only a 5 minute stroll from the house. The service is great and the setting relaxed. Newly renovated with outdoor seating overlooking the beach and children's playground. The Butter Factory: Is located in Pyree just 20 minutes away and serves modern Australian food with an emphasis on fresh produce. Fully licensed and bookings essential. Callala RSL Club: The Sea Dragon Restaurant serves Chinese & Thai meals. Currarong Bowling Club: The Bistro serves chinese meals. This light filled family home has a spacious lounge/dining area, separate dining/cards/games table and a large kitchen. There is an electric double oven and gas cook top and the cupboards are well equipped to cater for those that love to cook. The living areas opening onto the elevated terrace which spans the width of the house with outdoor seating and sun lounges overlooks the ocean and rock pool. The house features polished floorboards, ceiling fans and a combustion fire place to warm you during the winter months. Comfort on the Rocks is just as popular in winter as it is in summer! The combination of the winter sun filling the house and the roaring fire make winter a great time of year to escape. There are 3 bedrooms (sleeping up to 8 people maximum). The Main features a Queen Bed, Built in Robe, TV/DVD and an Ensuite. The second Bedroom features a queen size bed and a Built in Robe. The Third Bedroom has two sets of single bunk beds, a Built in Robe and a TV/DVD combo unit. The open plan lounge/dining/kitchen area which overlooks the ocean has all the comforts of home including a flat screen TV, plenty of videos & games, a wii console and a CD & DVD player with surround sound. There is a 3 burner gas BBQ with wok on the rear veranda. There are three bathrooms (2 internal & one external). The laundry has a washing machine, iron & ironing board.There is a second fridge in the garage catering for those staying for more than just a few days! The covered veranda at the rear of the property overlooks the large backyard where you can enjoy protection from the afternoon sea breeze and to enjoy alfresco dining all year round. There is plenty of space for the kids to run around and a hot water outdoor shower to rinse off after the beach. Pets are welcome but are not allowed in the house at any time - there is a large fully fenced rear yard, 2 undercover verandas and plenty of shady spots for him/her to relax.There is also an outdoor hot/cold shower where your pet can rinse off after a day at the beach as all the local beaches are pet friendly. Conditions and refundable bond apply. Doona's, pillows and blankets are supplied. Please bring own bed linen and towels. Linen is included in the tariff for Stays of 7 nights or more ONLY. Comfort on the Rocks IS NOT AVAILABLE for weddings, pre-wedding celebrations, schoolie groups or parties of any kind. All bookings are subject to our terms and conditions. On making a booking and paying a deposit we will forward you a confirmation email outlining the terms and conditions applying to your booking. Confirming a booking indicates your acceptance of those terms and conditions. Applied to all bookings at a minimum rate of $500 per booking. Pet Bond $250. Confirmation of booking will only be made upon receipt of a non-refundable 50% deposit. Payment of the balance is due 28 days prior to your booking. Payment by direct deposit. Steve and I have always loved the South Coast having spent many years with the kids camping at Boudi National Park. We were lucky to be able to purchase the house in early 2011. This is a family holiday home where we can spend time with our family and friends. It brings us much joy that we can also share our home with others to enjoy the beauty that Currarong has to offer. Comfort on the Rocks is unique allowing guests to enjoy watching evening sunsets over the ocean. Currarong is the perfect place to get away from the hustle and bustle of life. Location was excellent, great ocean views and very close to the rock pools which was great for the kids. House was clean and well looked after. Well stocked kitchen and lounge room with great entertainment options. Rooms were comfortable. Host was very communicative, pleasant to deal with and and quick to respond. We had a great time at comfort on the rocks and would definitely book it again. Some minor feedback was that the back verandah could be set up a bit better for groups with only 2 deck chairs and no seating except to sit on the steps, and the $25per person up-sell for linen was a first for all guests and we all felt it should be included in base fee (to be fair this was mentioned up front, but in small print and is easy to miss when your not expecting it as we did). Would recommend to friends. I am so glad that you all had a great weekend away and thank you for your feed back. With regards to seating the email with access details sent a week before your arrival explained that the deck chairs for the table on the front veranda are stored in the garage and would need to be brought out and returned to the garage on departure. The chairs are stored in the garage to keep them clean and out of the weather. The website clearly states that linen is not included for stays less that one week. We would prefer to keep the rate down and let guests have the choice. You never know what you are going to find when you first arrive at a new place, pictures, sure, they give you a clue, however until you open the front door, you can't be sure.. Well, in the case of Comfort on the Rocks, the pictures did not do it justice! With a large living area expanding into a huge kitchen and flowing out to the deck, then along with expansive views over the rock pools and ocean, relaxing with a book and watching dolphins was an easy choice. Want more? Stones throw away you are enjoying a dip in the lovely rock pools, or a slightly longer stone throw and you are at the beach! Feel like some exercise and some nature? No problem! Plenty of lovely bush walks starting from just nearby into the Beecroft headland with spectacular views of the Pacific ocean. In between that, the extensive range of movies and games kept us busy once the sun did go down. And after that, the beds were super comfy, so much so we checked the mattress to see what brand they were to replace ours at home! And to top it off and make it feel like a home and not a rental - Christmas tree with light and decorations spread around the living room, just beautiful! In summary, great place and love to visit again in the future! We had a lovely stay. House was in a perfect location and was well stocked. Water views from the house was added bonus, no need to move the car as could walk to Zac's, beach, rockpool, and bush walking trails. Will definitely stay again. Had a wonderful time at Comfort on the Rocks. The property has magnificent views of Currarong beaches and the rockpools. The house was very clean, bedrooms were large and the kitchen was well stocked. Perfect for a getaway for those wanting to be on the water.